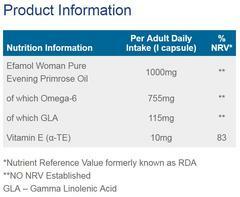 GLA (gamma linolenic acid) is the active ingredient found at high concentrations in Efamol Evening Primrose Oil. Efamol’s golden colour demonstrates the rich source of the Omega-6 nutrient GLA. Efamol Evening Primrose Oil contains 11% GLA, 33% more than most other Evening Primrose Oils. Recommended dosage: 1 or 2 capsules daily with food. 1.Shaikh, I.A.A et al. (2010). Enhancing cytotoxic therapies for breast and prostate cancer with polyunsaturated fatty acids. Nutrition and Cancer, 62(3): 284-296. Rigel, the patented Evening Primrose plant, is grown in ideally selected areas of The Netherlands and New Zealand by dedicated farmers. Efamol have developed a unique ‘Liquid Gold’ extraction process which retains natural ingredients of the seed in their most bioactive form. Efamol are proud to be able trace the content of each capsule back to the country, region and even farm, where the seed was harvested. Efamol Evening Primrose Oil contains active ingredients that work with your body over time; you may need to take them for up to three months before experiencing the full benefits. 1. Shaikh, I.A.A et al. (2010). Enhancing cytotoxic therapies for breast and prostate cancer with polyunsaturated fatty acids. Nutrition and Cancer, 62(3): 284-296.